There is a tattoo across my left bicep, a name written in Tamil. People often ask me what it means, or what it symbolizes. Each year on April 20 I find the courage to press into a painful story and remember a little girl who changed my life. Although much smaller than other children her age, Suryakala, also known as Surya, held a huge place in my heart. She made a tremendous impact on me and everyone who met her. Her soft, quiet voice was sing-song perfect. Her eyes were beautiful and full of life. Her smile was tender, innocent and pure. Although her body was terribly weak, Suryakala embodied strength. Suryakala died due of complications from AIDS. Phileena and I last saw her just weeks before her death. She looked great. The antiretroviral prescription that she was taking had helped her so much. I remembered clearly how sick she had been and celebrated her dramatic health improvements. I hoped for the future that could be hers, and grieved the childhood she had lost. Just weeks after our visit with her, she took a drastic turn for the worse. She died April 20, 2006 in peace and without pain. I met her seven years earlier, when she was just 3 years old. She had tuberculosis, and I remember holding her frail body against my chest to try and keep her warm; every time she coughed, it shook her entire frame. She was so weak she could hardly hold her head up. I left Chennai that time, fearful that I would never see her again, believing that her sickness would overcome her. To my surprise, she recovered and not only did she recover, but she seemed quite healthy, and her little body began to grow. Phileena and I spent much time with Suryakala each time we visited India. She had lost her mother to AIDS; her father was very sick with AIDS when he brought his two daughters to our childrens homes in Chennai. Just a couple of years ago, Surya’s father also died from AIDS. 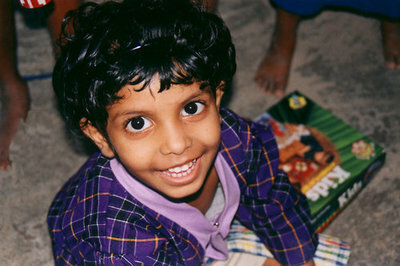 Phileena and I were in Chennai at the time and spent as much time as we could with Surya and her older sister. During that time of grieving and mourning with them, my love for these two young girls deepened. I count it one of the greatest privileges of my life to have seen Suryagrow from an undernourished little girl to a thriving 9-year-old, grieving with her during the loss of her father and making memories that are now cherished treasures. I imagine her now, full of health and life in the loving arms of God. I imagine her now, surrounded by the countless other children whose lives have been tragically cut short. I imagine her now, reunited with Esther Noel, Ragini, Abraham, Baby Sarah, Prema and the other children from her childrens home who have also gone to be with the Father. Today there is a small, white-washed concrete cross that bears her name. It rests with her remains in a graveyard in Chennai, India, surrounded by her brothers and sisters, other children who we have had the honor of loving. All those little white crosses are a memorial to us they remind and compel us to continue the fight for the lives and lost childhood of the nations. In Surya’s life, she was perfect in her uniqueness. In her death, she lives on as symbol of hope for the millions of other children like her who suffer today. And for us, Surya’s death is a prophetic reminder of the thousands who will fall without a tear children who wont have a grave to visit and friends who mourn their deaths.